Find out more about the AA’s star-ratings on their website. The Royal Duchy Hotel is now one of just fifty four-silver star hotels in the UK among the thousands that the AA inspects every year. 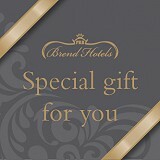 First established in July 1893, the Brend family bought the sea-front hotel in 1977 and nurtured it to become one of Cornwall's finest hotels. Renowned for its superb facilties including indoor swimming pool, two AA Rosette dining, sumptuous spa treatments and outstanding customer service; the latest accolade concretes The Royal Duchy Hotel as Falmouth's leading luxury hotel. "We are thrilled that the hard-work of our dedicated team of staff has now been recognised by the AA, also complimenting the two AA Rosettes for dining that our Pendennis Restaurant continues to hold. The Brend family has invested considerably into the hotel over the years, with many new and exciting projects planned for the future. The Directors, Management and Staff are proud to receive this very prestigious award and looking forward to another busy year ahead"
The Royal Duchy Hotel is part of the Brend Hotels group, a family run company that has been a leader in West Country hospitality for over 50 years. The group were previously announced as the winner of 'Hotel Group of the Year' in the AA Hospitality Awards 2015-2016.